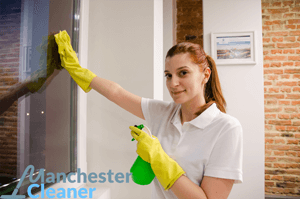 Our office cleaning in Manchester is suitable for any type of business, from small retail spaces, like bakeries and pubs, to restaurants and hotels. Book the licensed cleaners for your commercial premises and forget about all cleaning worries. Create the ideal working atmosphere for your employees and bring the feeling of success in your potential clients. Our office cleaning service can be customised according to your office size, specific preferences and requirements. It can be scheduled for a day and time of the week that is suitable for your business workflow and will not cause any disruption. Book the fully-trained office cleaners first as a one-off appointment to check their expertise and when you like it - dial 0161 823 0200 for our fixed schedule commercial cleaning that ensures improved business results. Note: You can add exterior window cleaning and professional carpet cleaning to your appointments at special rates. Note: You are more than welcomed to share your personal cleaning requirements and the cleaners will follow your priorities. Call 0161 823 0200 now to get in touch with our customer care agents or fill in the form below.